An Asian dining table is incomplete without a bowl to hold rice in. We know that soup bowls might be too small to hold multiple portions of rice, but salad bowls might be too big. At Mrs. Lin's Kitchen, we have a selection of Japanese rice bowls that are just the right size to serve rice in. Our collection of rice bowls features a wide variety of designs and styles. Many of our Japanese ceramic bowls feature beautiful and symbolic cherry blossom designs, such as the Minimalist White Cherry Blossom Japanese Rice Bowl and the Dark Blue Cherry Blossom Japanese Rice Bowl. 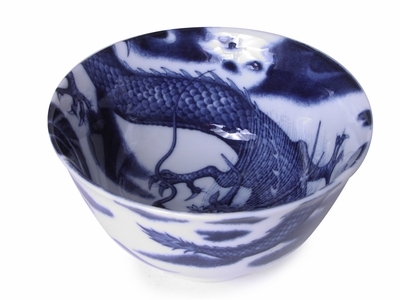 We also provide many traditional blue and white rice bowls such as our Dragon in the Sky Rice Bowl and the Parasol Illusion Japanese Rice Bowl. There are so many beautiful designs for you to choose from, so feel free to take your time choosing the perfect Japanese rice bowl! Perfect for serving any steamed or fried rice, these Asian bowls will give your table that push of color that it needs. Use the Black Alloy Rice Bowl to accentuate the colors of your food or catch your guest�s attention with the unique textures and colors of the Matte Black and Shiny Blue Rice Bowl! Though small, rice bowls have the power to transform any table into one of sophistication and elegance. These wonderful ceramic rice bowls are great for rice, cereal, snacks, and even soup! Dishwasher and microwave safe ceramic makes clean up easy even with the stickiest rice and allows you to reheat food right in the Japanese rice bowl, making meal preparation and clean up so much easier. Pick and choose your favorite rice bowls to welcome into your home and enjoy a delicious rice meal with a bowl that you�ve personally chosen!